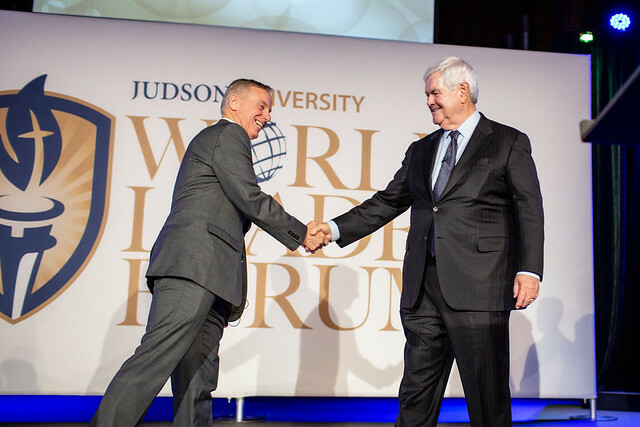 Judson University in Elgin today hosted a lively bipartisan discussion between former Speaker of the House Newt Gingrich and former Vermont Governor Howard Dean for the 2018 World Leaders Forum. The event, titled “A bipartisan conversation about leadership in divided times,” marks the first time since 2011 that Gingrich and Dean have shared a stage. It is also the first time that two people have keynoted the World Leaders Forum since the event’s inception eight years ago. Judson University selected Dean and Gingrich to showcase how two national political leaders with opposing viewpoints can respectfully disagree in a productive way. Courtesy Judson University. Photo by Kevin Sherman. At the event, Dean and Gingrich spoke about topics such as partisan attacks, election reform, federal debt, congressional term limits, and hopes for America’s future. Click here to download photos from today’s event. The goal of the World Leaders Forum is to offer Judson University students and the surrounding community an opportunity to be inspired by significant thought leaders with a global perspective. Proceeds fund Judson leadership scholarships and innovative entrepreneur activities. Previous World Leaders Forum keynote speakers have included George W. Bush, Mikhail Gorbachev, Tony Blair, Condoleezza Rice, Her Majesty Queen Noor of Jordan, and Felipe Calderón. Newt Gingrich was first elected to the United States House of Representatives in 1978 and served until 1999. During that time, he served as the House Minority Whip (1989-1995) and the 50th Speaker of the House (1995-1999). Under his leadership, Congress passed welfare reform, the first balanced budget in a generation, and the first tax cut in 16 years. In addition, the Congress restored funding to strengthen defense and intelligence capabilities, an action later lauded by the bipartisan 9/11 Commission. In 2012, Gingrich was a candidate for the Republican Party Presidential nomination. As an author, he has published 35 books, including 15 New York Times bestsellers. Today Newt Gingrich is a Fox News contributor. He is a senior advisor at Dentons, the world’s largest law firm, and serves as a senior scientist with Gallup. Governor Dean gained national prominence as a U.S. Presidential candidate in 2004, and he served as the Governor of Vermont from 1991 to 2003. During that time, he created a record of promoting equality and opportunity for his constituency and employed a philosophy of fiscal responsibility – advocating low taxes, reduced government spending, and minimal government debt. His successes prompted Governing magazine to proclaim him "Public Official of the Year" in 2002. His leadership roles also include turns as chairman of the National Governors’ Association, the Democratic Governors’ Association, and the New England Governors’ Conference. He led the Democratic Party to success as Chairman of the Democratic National Committee from 2005 to 2009. He is credited with pioneering an energetic 50-state strategy and the development of 21st century campaign tools that helped Democrats make historic gains in the 2006 and 2008 elections. Photos by Robb Davidson, Kevin Sherman, Courtesy Judson University.